Professor Tetsuya Higashiyama1, Dr. Daisuke Maruyama2 and their co-researchers3 have discovered a mechanism by which angiosperms can be made to cease fertilization, and succeeded in creating a seed with a genetically distinct embryo and endosperm. Their paper was published online inDevelopmental Cell on May 13, 2013. Angiosperms have two reproductive cells, the egg cell and central cell. They fertilize them independently and develop the embryo (the rudimentary plant in seeds) and endosperm (the nutritive tissue in seeds). When a pollen grain sticks to a pistil, a pollen tube grows from the grain towards the ovule and carries the sperm cells. One grain provides two male gamete cells, which have the same genetic code, and fertilize the two female reproductive cells simultaneously. Once those two cells are fertilized, the plant ceases the pollen tube attraction. Therefore, it was previously believed that it is difficult to producea genetically distinct embryo and endosperm. 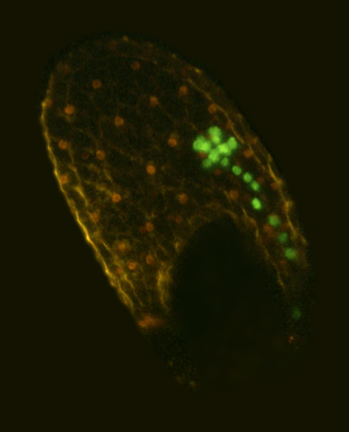 The group used mutant Arabidopsis thaliana as biological material, which randomly induces single fertilization in either the egg cell or central cell. First, they investigated the relationship between the fertilization of the two female gametes and the cessation of the pollen tube attractants. As a result, when single fertilization occurred, the plant continued to allow other pollen tubes to approach the ovule. Thus, the group posited that after the single fertilization, the remaining cell would be fertilized by a sperm cell, which comes from a different pollen grain. Consequently, each egg cell and central cell is fertilized by a distinct sperm cell, and the team succeeded in producing a seed with a genetically distinct embryo and endosperm. By applying the outcomes of this research, it is possible to send the optimal sperm cell to each reproductive cell. This is widely expected to contribute to the production of new plant varieties, which will be more useful and much easier to take care of. 1. Professor at the Institute of Transformative Bio-Molecules, Nagoya University, and Research Director at ERATO Higashiyama Live-Holonics Project. 2. Post-Doctoral Researcher funded by the Japan Society for the Promotion of Science. 3. Hidenori Takeuchi, Daichi Susaki, and Moe Nishimaki (Division of Biological Science, Graduate School of Science, Nagoya University), Daisuke Kurihara, Ryushiro D. Kasahara (JST, ERATO, Higashiyama Live-Holonics Project, Nagoya University), and Yuki Hamamura (Bioscience and Biotechnology Center, Nagoya University). Professor Higashiyama's group began this research due to their interest in which reproductive cell, egg cell or central cell, would cease pollen tube attraction. Because of the research, it has been made clear that both cells are required to stop fertilization, and they succeeded in fertilizing each cell with a genetically distinct male gametophytic cell. They reached this outcome by using unique technology to observe fertilization in pistils. "Now that we have succeeded in producing a seed with a genetically distinct embryo and endosperm, I would like to develop some new breeding technologies, e.g. a technology to produce bigger seeds." "The phenomena of life are veiled in mystery, for example, plants systemically function without a central nervous system. Why not become the first researcher to discover a new mechanism of plant life?"